Eddy couldn't have been more than 3 days old the first time that Tim asked me, "So, when can we, like, throw him on the bed?" We are visiting Eddy's grandparents in Houston this weekend and there is lots of space to throw kids out here. People said really sweet things about last week's picture. It is my favorite yet of the series. Thank you!! And after clicking around a TON, my favorite shots from last week are this one (note to self: bring a bucket on our next camping trip) and this one. Oh, how I long for a nap that looks like that. Giant bed, scattered blankets. I have found so many amazing, new blogs through this little (big) link up and I love it. Thank you, Jodi. I think husbands everywhere wonder the same thing. My husband asked me a version of this when our first daughter was born too! Lovely pics; off to check out the rest of your blog! I guess dads just skip straight to the party, huh? Nothing wrong with that, I suppose. Hopped over to your blog! I love this! Love the movement. We do this every morning with Claudia and soon with Paddy. 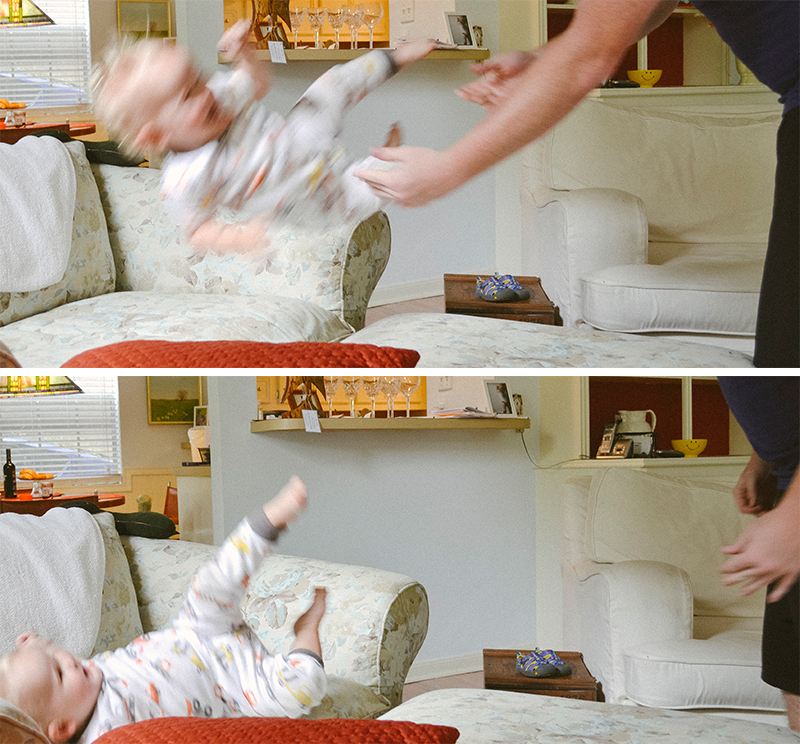 Claudia calls this "baby slam!" Enjoy Houston!! This is amazing... you guys are too much fun! How fantastic, it looks like great fun! Love the movement and the energy you have captured in your photos. We were the opposite. I threw Jarvis onto the bed and Justin had a freak out. But then Jarvis is my second and his first. Now the two 'boys' play so rough together is scares even me. Jarvis's favourite thing is to jump off things into Daddy's arms. wow the flying child, what fun! Beautiful photos. Looks like fun!! The children enjoy it as much as the Dads- the little daredevils! Awesome action shots!!! Eddy looks like he LOVED it.